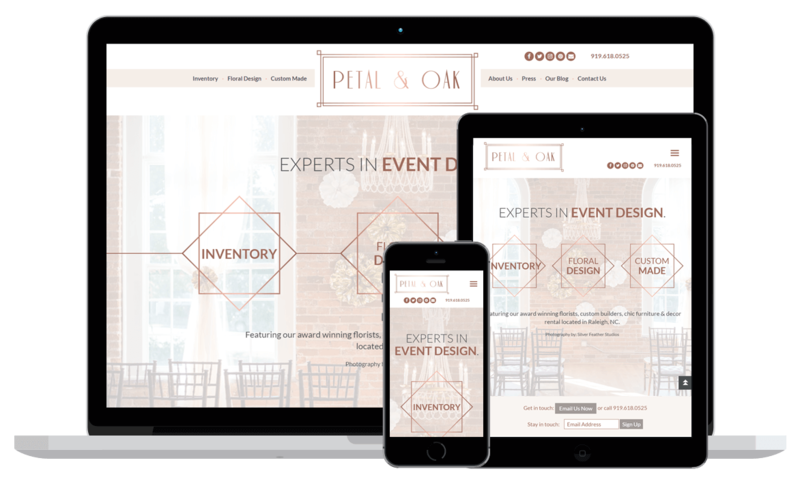 Announcing New Website Launch: Petal & Oak - WebWorx, Inc.
Well, what better time to post about a new client website on this fine snow day in Richmond, VA. All the schools are closed and people are getting in minor accidents all over the state (people be careful out there!!). We decided to stay home today, work from our home offices and hang with the kids – all whom have been to school a total of 3 days since January 2nd due to snow. Time to do some social media stuff on this slow snow day! We were so excited to be contacted by our new clients and friends at Petal & Oak, the event rental division of Triangle Catering in Raleigh, NC. Petal and Oak went through an extensive rebranding process which resulted in a soft, elegant and easy to navigate website design and development. This is an example of a CUSTOM WordPress website design and development projects. It also includes the RW Elephant inventory manager which has an admin to manage inventory and provide quotes. Petal & Oak couldn’t have been any nicer or easier to work with. We wish them the best success with their new branding, new company and happy customers along the way!! Learn more about how the site was developed. PS: We would like to give a shout out to Paisley & Jade! They coached Petal & Oak on the event rental process and they liked what they saw in Paisley & Jade’s website! We LOVE our clients! !